This summer my sister, Jean, and I explored the back roads and small towns along the North Carolina Coast during a four-day road trip. Our starting point began at the Virginia border; we traveled south to Wilmington and then headed back north to the town of Washington. We followed Route 168 through the Great Dismal Swamp making a left turn at Route 58, eventually merging with Route 17. The towns of Elizabeth City, Hertford and Edenton rested on tributaries of the Albemarle Sound, part of the Atlantic Intercoastal Waterway. 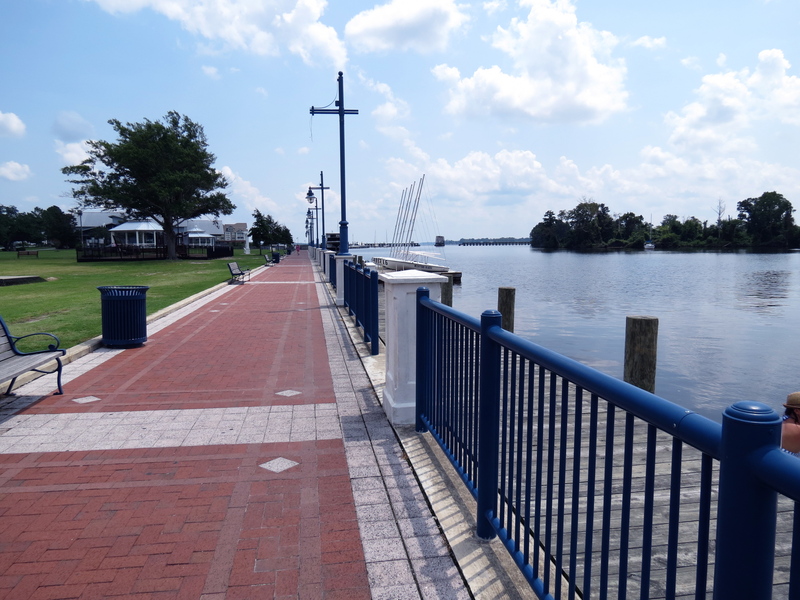 We started off somewhat late so we had to zip through Elizabeth City, which had an extensive waterfront on the Pasquotank River. This waterfront extended from the outskirts of the city into an attractive harbor within the town. Older buildings from its mercantile era lined the downtown streets. We decided to return at another time to take one of their historic tours or come back for the Potato Festival in May. Lovely Georgian and Victorian cottages stood along the main street of Hertford, another historic town, whose founding goes back to 1600s. We followed one of the side streets to get a closer look at the houses, many of which faced the Perquinmans River. Spanning the river, a bridge dating back to 1928 retains the claim of the only S-shaped swing bridge. Local citizens initiated a campaign to save the bridge as it now has weight limits; officials require that school buses take another route into town. Buildings along the downtown district represented various architectural styles from the 18th and 19th Century. The wide main street with unique shops on either side led to grand views of the river. We walked toward the docks, stopping to admire the Cupola House, built in 1758, and brought back to its glory by dedicated volunteers. Further down the street, we stepped into the Community Arts Center, which featured displays of local art work. 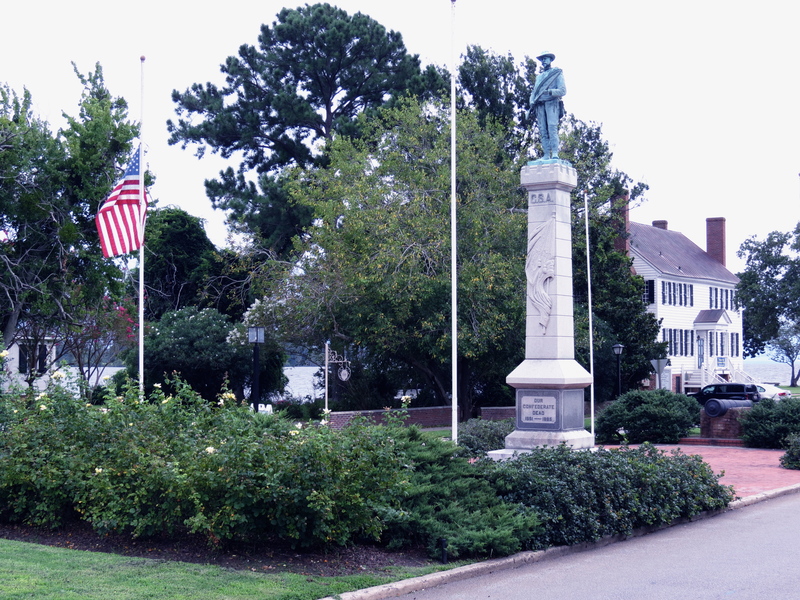 A Civil War monument marked the entrance to a park on the waterfront. The white building at the end of the street housed a museum; an unusual looking lighthouse supported by pilings stood on the other side. 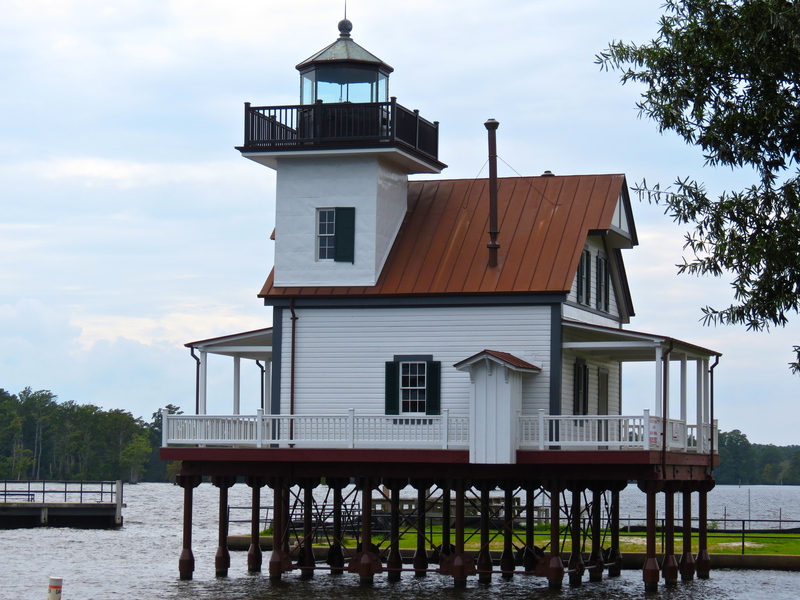 Originally, the 1886 lighthouse occupied a place on the Roanoke River but found a permanent home on Edenton Bay just this past spring. We followed Route 17 to New Bern with only a slight detour, as somehow we wound up in wrong direction on Route 64 toward Rocky Mount; we made a U-turn and headed back in the right direction. 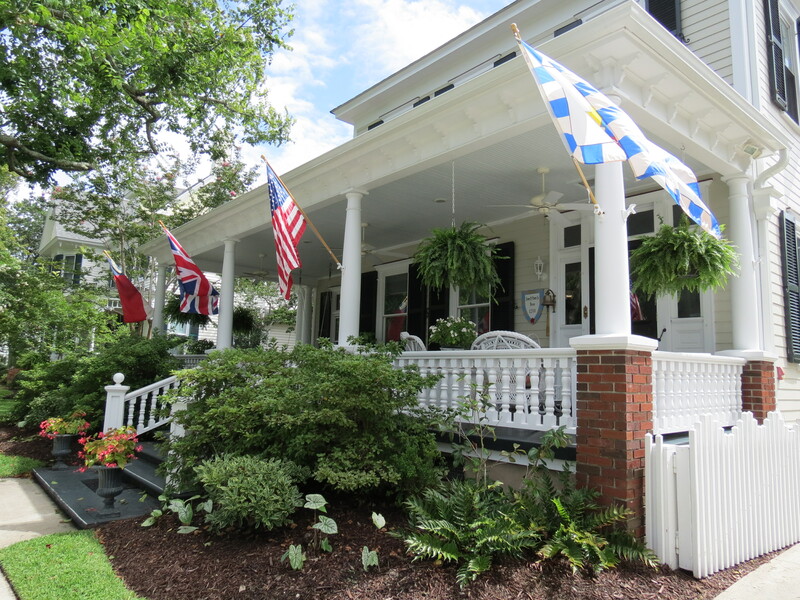 We stayed the night at Hanna House Bed and Breakfast, 218 Pollock Street, in the historic district. Built in 1896 with characteristic high ceilings, the proprietors decorated the home with Victorian antiques. The innkeepers offered a great choices for breakfast. Jean selected eggs baked in a puff pastry shell, sprinkled with fresh garden herbs and topped with a sweet red pepper sauce. I chose French bread stuffed with cream cheese, toasted pecans, dried Michigan cherries and lemon zest. By mid-morning the skies opened up, heavy rain limiting our options in New Bern, which hopefully next time will include a visit to Tryon Palace and Gardens, the governor’s house when the town was the first capital of North Carolina. 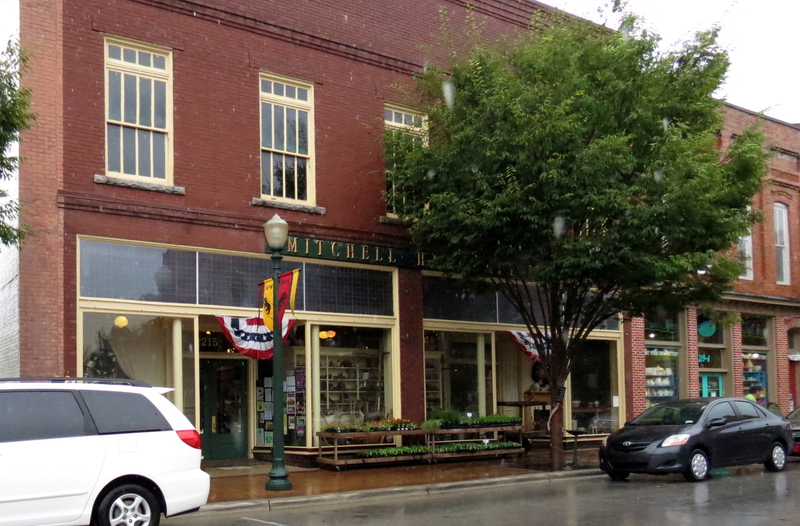 One of guests at the bed and breakfast suggested we visit the Mitchell Hardware Store if we needed to wait out the rain in an interesting place. 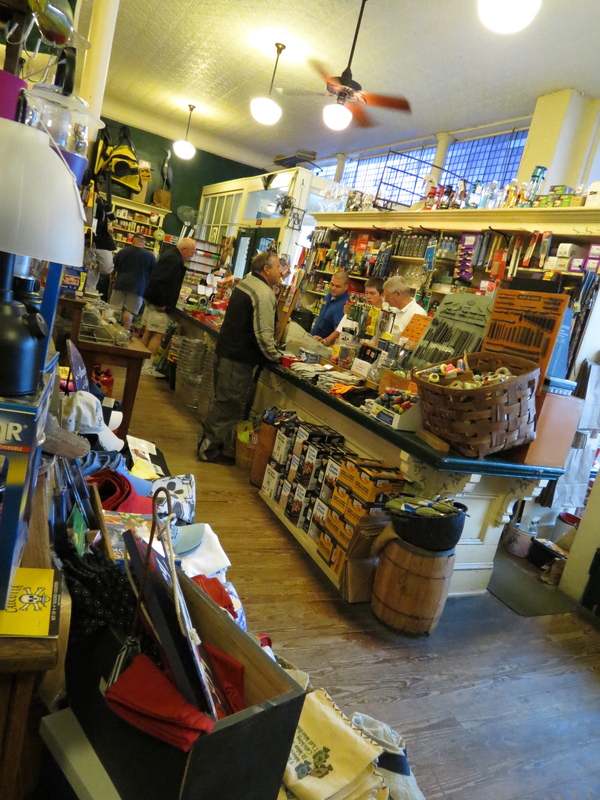 Operating since 1898, the store reflected the turn of the century ambiance with a pot-bellied stove, rows of cases for screws and nuts, and a variety of old-time merchandise, such as lanterns, barrels and baskets. We spent several hours wandering up and down the isles as the rain poured outside. 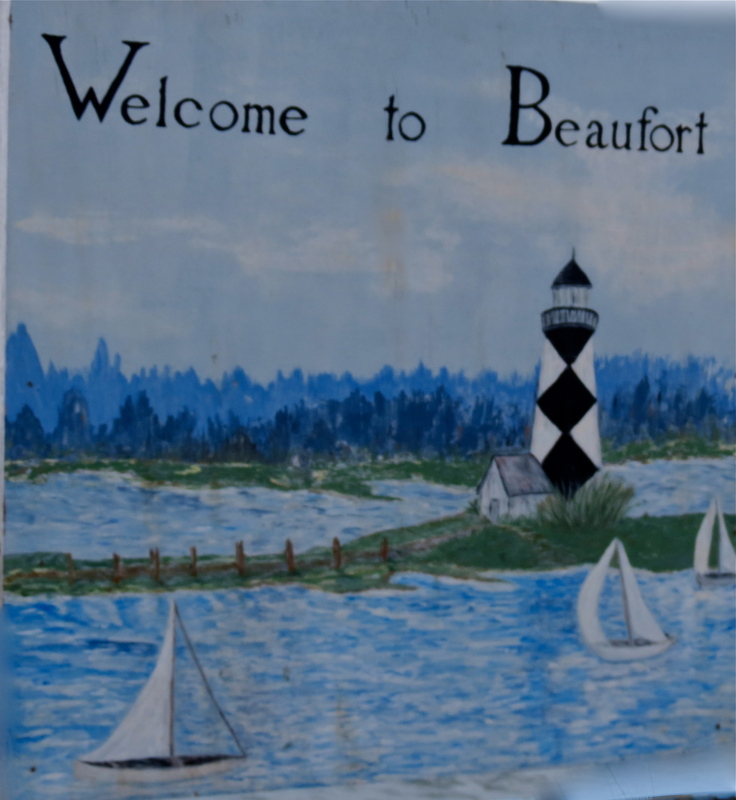 As we arrived in Beaufort, we found the town overrun with people streaming down toward the wharf. After scouring the neighborhood streets for a parking place, we headed the way of the crowds toward the waterfront. Some folks dressed up in costumes–this began to look like fun! Turns out, we arrived just in time for a pirate invasion! Costumed folks lined the piers, and watched as the events unfolded on the river. A classic topsail schooner led the invasion by sea, her pirate crew taking aim at the shoreline blasting the cannons. Muskets fired back in defense. Pirates in longboats ploughed the water, and buccaneers on land brandished swords. Townsfolk cheered as the pirates clashed with the military guard. We just happened on Beaufort’s annual Pirate Invasion: It Takes a Village to Pillage event, the town’s recreating of an actual pirate invasion in 1747. The story goes that Spanish privateers came into the harbor and stole several ships, easy pickings when only a few men guarded the coast. Not satisfied, the pirates returned several months later to take the town! About fifty militiamen were not enough to protect the village, and citizens high tailed it out of the area. After collecting more recruits, however, the militia counterattacked, driving the pirates out for good this time. Blackbeard supposedly had been a frequent visitor to Beaufort. In 1718 he commented that Beaufort was a poor little village. The governor of Virginia, tired of piracy along the coast, sent two sloops on a mission to capture Blackbeard; they discovered his ship and an intense battle followed in which Blackbeard was killed. Three hundred years later divers discovered the wreckage of his ship, Queen Anne’s Revenge, in Beaufort Inlet. The weekend featured all sorts of pirate activities from sword dancing, pirate cruises and costume contests. The highlight of the event was the trial and supposed hanging of the pirates. With so many events, I would come back and enjoy the entire weekend! Music and action in the video . . .
After all the excitement of the pirate invasion, we spent some time exploring this quaint seaport village. As a historic site, the town has a number of restored buildings, some dating back to 1778. You can hop a double-deck bus for a tour, and a guide can take you through the 300 year-old Old Burying Ground. 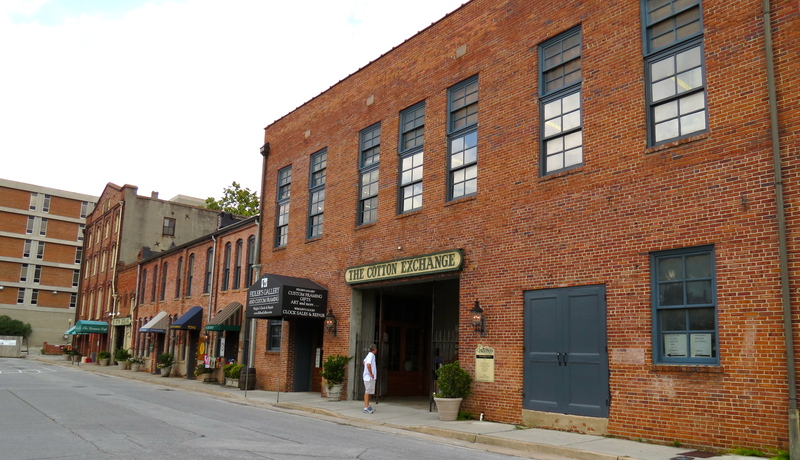 On Front Street, the North Carolina Maritime Museum features exhibits of the maritime history of the area. A variety of shops and restaurants line the main street along the waterway. While wandering along a side street, we came across the Beaufort Grocery and went in for lunch. We ordered “North Carolina caviar,” which turned out to be a delicious bean salad, the best I’ve ever had. From the menu we selected “Gougeres,” a pastry made of choux dough mixed with cheese, a first-time treat. 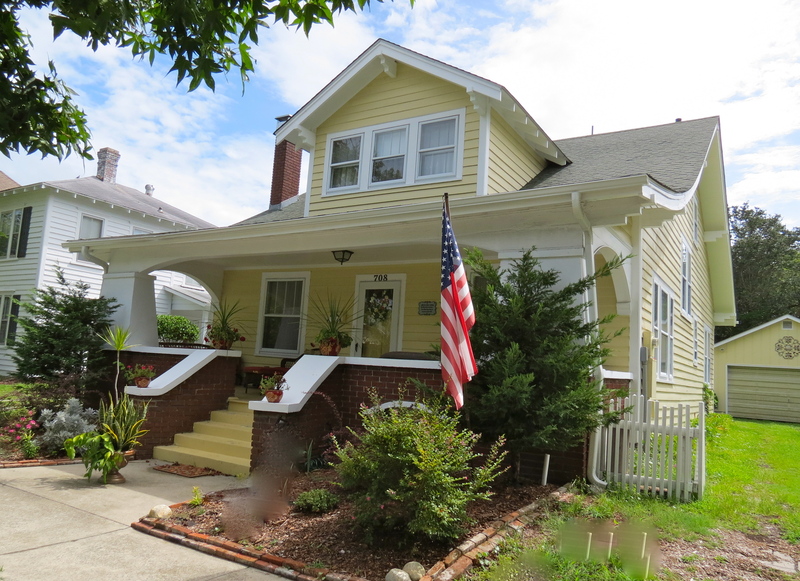 We strolled through the neighborhoods, where the homes represented a variety of architectural styles from Victorian and craftsman’s bungalows to fisherman’s cottages. Gardens surrounded the houses, usually with front porches displaying antique chairs, pottery and assorted decorative items. Plaques titled each home including the year it was built. 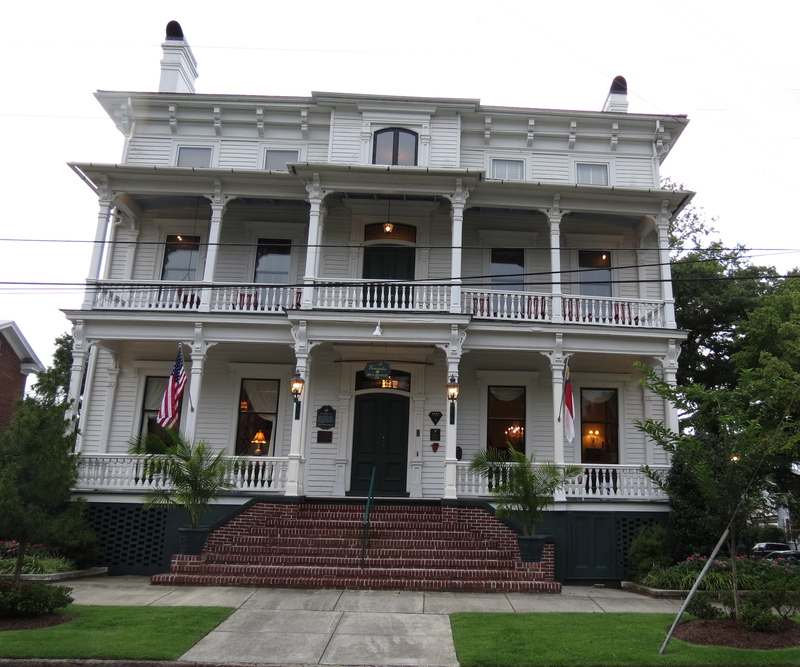 We reserved a room at the Verandas Bed and Breakfast, a Victorian Italianate Mansion located a few blocks from the Cape Fear waterfront and downtown Wilmington. Built in 1822 for a local shipbuilder, the home once served as a school and convent. The choice of this B&B was down to their advertisement that they had “beverages and snacks in the Butler’s Pantry all day long.” The home had been beautifully restored from when a fire almost destroyed the home back in the 1990s. We explored all four verandas, front and back, and climbed into the cupola at the very top of the house for a view of the surrounds. The neighborhood homes dated back about a hundred years or more, each with a unique architectural style and surrounded by gardens. After settling in, we walked the tree-lined Front Street into town that bustled with crowds. After checking out the local shops, we took a short cruise on the Cape Fear River. 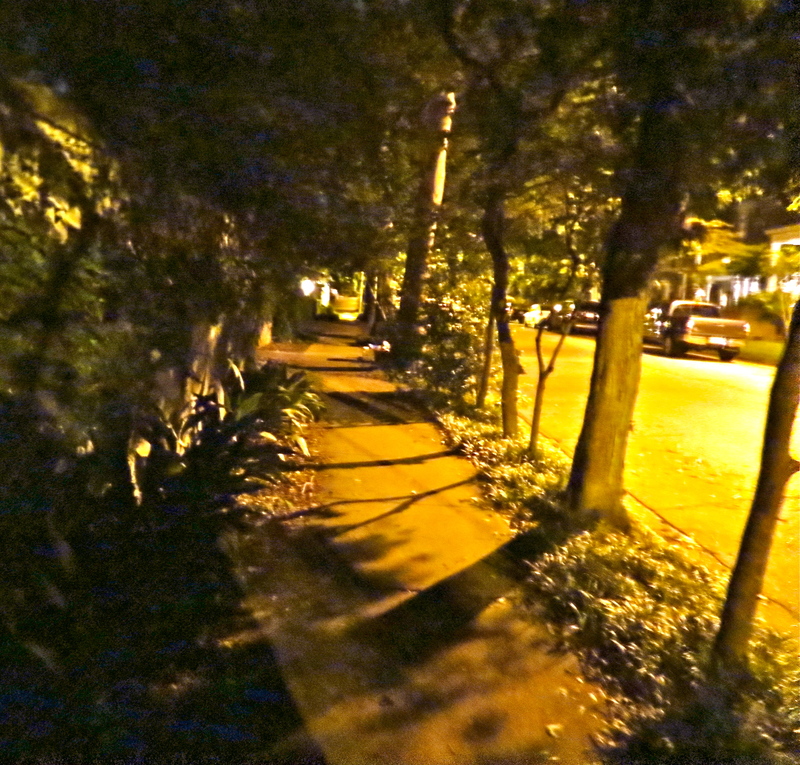 Walking back through one of the side-streets, the trees, covered with Spanish moss, formed a canopy overhead. The next morning a we boarded the trolley for a tour of the historic homes. 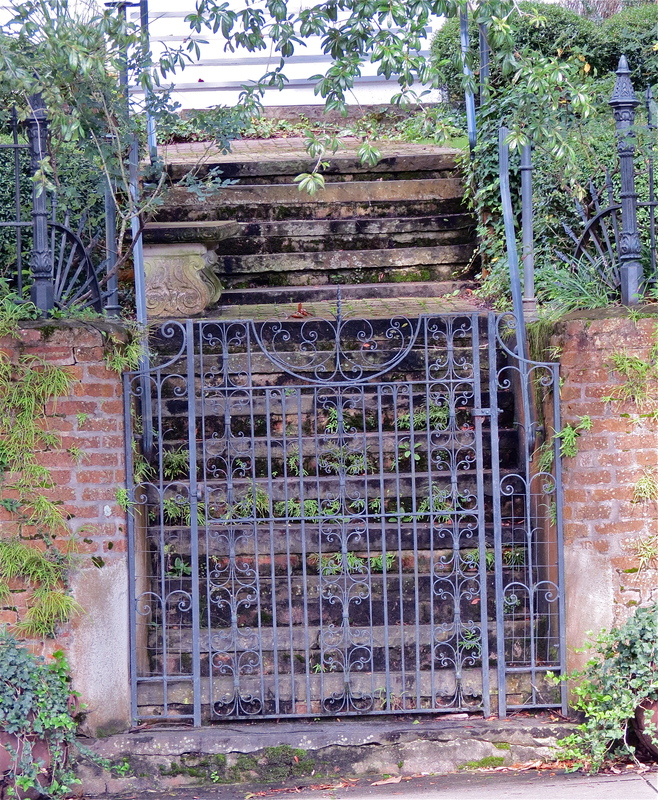 Elaborate iron work decorate many of the gardens, much of this art produced by the Wilmington Iron Works, now out of business since 2000. The business began in 1883 and made everything from cannonballs for the Confederate Army to street furniture. Sometimes the company would destroy the pattern after casting the decorative iron work for a particular home. After the trolley tour, we stopped to explore the shops in the Cotton Exchange, a building which once housed the largest cotton export business in the world. The Exchange connects eight buildings, and we explored the each level and walked through many of the specialty shops. 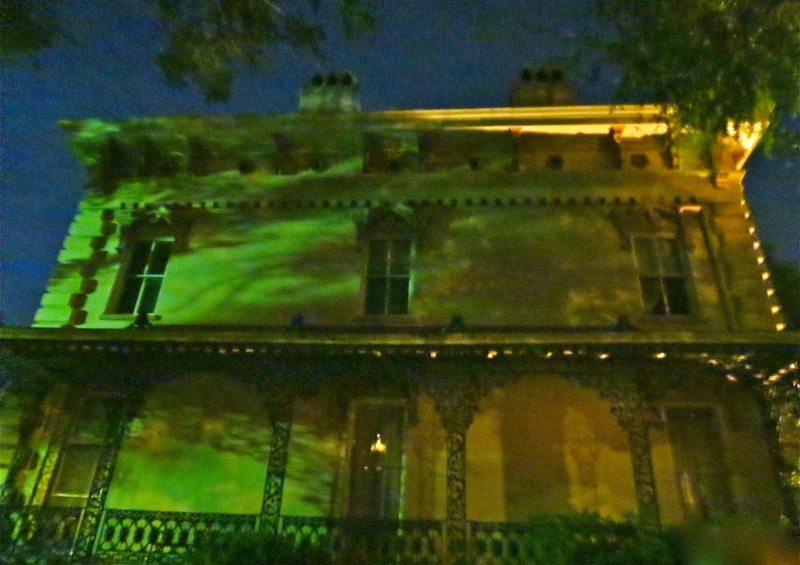 That evening we signed up for a ghost walk of old Wilmington. Before the walk, we finally surrendered to the delicious aroma of waffle cones, which we valiantly resisted for two days. The cone, filled with chocolate fudge ice cream, was huge, and I ate every bit of it. Our guide escorted us through the dark streets, burial grounds and alleyways of the city, stopping along the way to tell us stories of the people who lived there long ago. The stories retold during “ghost walks” offer a people’s history: how the average folks lived day-to-day. Our guide related a story of a woman who lost several children and supposedly still wandered about her house looking for them. The guide requested that if we photographed the home, please send pictures back to them as often ghostly images appear. Now, I’m not sure what it is, but there’s something eerie about that middle lower window. The next morning we started back to Virginia. We briefly stopped at the town of Washington on the Pamlico River. The folks at the Visitors’ Center, which was located on the waterfront, passed along informative brochures of the area. A lovely brick walkway extended along the river for almost a mile, and eclectic boutiques lined the downtown main street. If we had more time, our itinerary would have included Bath, Southport and Morehead City; next road trip we plan to explore some of the smaller villages that dot the coastline. We look forward to another day when we can encounter more pirates and ghosts along the Inner Banks of North Carolina.